This class takes place on Saturday, May 11, 2019, 9:30-11:30 AM Pacific time. Fashion is a big part of science fiction and fantasy where clothes create a sense of settings and cultures. Since fashion is inextricably linked to both wealth and taboos, it can be an exciting way to develop the world of a story. In this workshop, we’ll unpack the causal chains of commerce, technology, and social order that go into creating fashion. 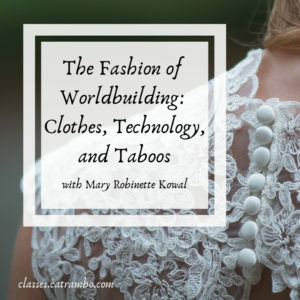 Join Mary Robinette Kowal for a workshop in which she teaches you how to flesh out your world and its fashions. Classes are taught online and require a reliable Internet connection, although in the past participants have logged on from coffee shops, cafes, and even an airplane; a webcam is suggested but not required. Cost is $99 ($79 for former students, which includes classes/workshops with me in other venues, such as conference or convention workshops and mentoring sessions).